The academic discipline of International Relations strives to attain a ‘global’ spirit to narrow the cognitive gaps between the West and the Rest. On the one hand, there is the hegemonic presence of mainstream universalist Eurocentric IR theories, and on the other the counter-hegemonic presence of particularist Post-colonial and De-colonial non-Eurocentric IR theories. Nevertheless, both theoretical traditions endorse ‘epistemological dualism’ that essentially separates the ‘theorizing-subject’ from the ‘theorized-object’; thereby failing to bridge the gaps. This book uses the monist schema of ‘subject-object merger’ in the ancient Indian philosophy of Advaita to inaugurate a Global IR theory. In the global theoretical schema of Advaitic monism, the apparent particularist reality is supplemented (not contradicted) with the hidden universalist reality – the net result of which is a reconciliation of dualism with monism at the theoretical-practical level. The possibilities of this reconciliation have not been estimated at either level and as such, this untapped intellectual strategy stands to enrich both Eurocentric IR and non-Eurocentric IR. 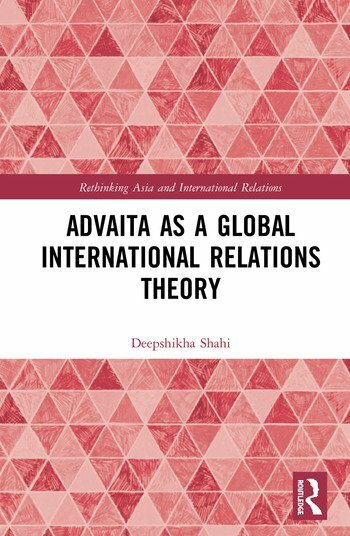 Shahi establishes Advaita as an alternative epistemological-methodological tool to re-imagine the complex realities of contemporary international politics. This fully fledged Global International Relations Theory will appeal to students of international relations, political theory, administrative theory and philosophy. Deepshikha Shahi is Assistant Professor of Political Science at the University of Delhi, India. Recently she was a Post-doctoral Fellow at the Centre for Global Cooperation Research (Käte Hamburger-Kolleg), University of Duisburg-Essen, Germany. She has also been a Research Affiliate with International Democracy Watch (Italy), Transnational Institute (Netherlands), Torino World Affairs Institute (Italy), Institute of International Affairs (Italy), and Institute for Defence Studies and Analyses (India). She had earlier worked as a technical proposal writer for the Society of Afghan Women in Engineering and Construction (Afghanistan).